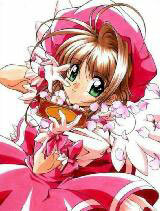 You are going to Watch Cardcaptor Sakura Episode 29 English dubbed online free episodes with HQ / high quality. Stream Anime Cardcaptor Sakura Episode 29 Online English dub Sakura’s Sweet Cooking, Sakura is in the kitchen practicing making cakes for an upcoming home-economics class with her Dad as her teacher, as Sakura is worried about how she will do. Later on at school everyone is deciding what cake to bake tomorrow, when Ms. Mizuki comes in and talks to Sakura, who agrees to bring Ms. Mizuki some when she is finished. After school, Sakura and Tomoyo are walking and spot Li, they talk then Yukito shows up. Back as the Syaoran household, Meiling tries (and fails) to cook Li a cake and gets upset she didn’t make it well. Tomorrow, at the day of the home-economics class everyone begins making their various cakes. Soon after lunch break, everyone leaves their cakes in class.